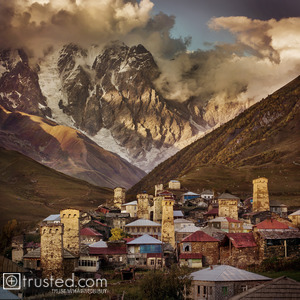 Sunset in the village of Ushguli, Svanetia, under Mount Skhara, Georgia. National Geographic | Fine Art Galleries presents fine art photography through exclusive limited editions embodying the rich heritage of the National Geographic Society and National Geographic magazine since 1888. Sunset in the village of Ushguli, Svanetia, under Mount Skhara, Georgia. Because of the number of 12th-16th century defensive towers, the village has been designated a UNESCO World Heritage Site. It is also the highest inhabited village in Europe.